Are you up for taking a health and fitness challenge with me during one of the hardest times of the year in terms of holiday parties, office potlucks, and family gatherings? Ready to test out your mental and physical toughness to jumpstart your weight loss and fitness goals before the end of the year? Don’t know how or where to start? 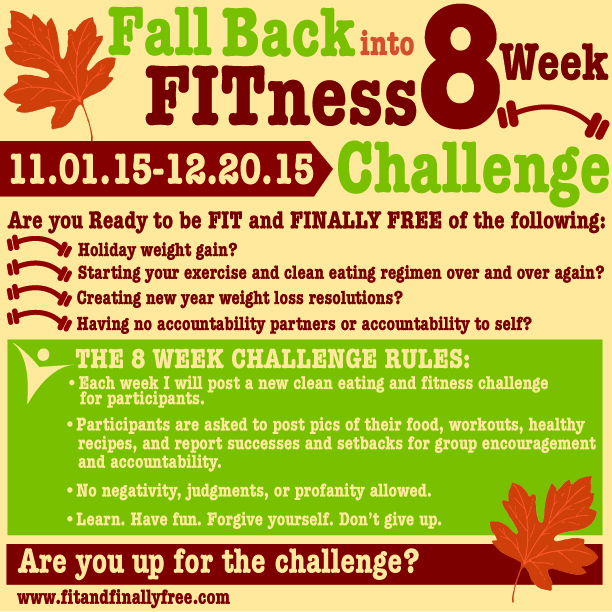 Fall back into fitness by signing up for my 8 week clean eating and fitness challenge beginning this Sunday, November 1st. Weekly challenges will only be posted via my social media pages and not my personal FB page. So, if you’re ready to become fit and finally free, need some online accountability partners, and want to beat the battle of the bulge this holiday season, take the challenge and start following me today.